In 19th century Europe, the piano and the guitar were good friends in chamber music. In those days, before the advent of radio and television, people played music in the comfort of their homes. Because the piano and the guitar were popular instruments, composers wrote for them. Grand sounds of the orchestra were translated into piano transcriptions. The lives of the piano and guitar diverged greatly when the piano went through extensive renovation and technological improvement. Not to say that the piano was mightier than the guitar, but more composers wrote for the piano than any other instrument. As such, piano builders refined the acoustics of the piano, making it louder than before. The guitar, by contrast, stayed mellow. "What sounds better than a guitar?" In terms of guitar duos, I have heard guitar and flute, guitar and violin, guitar and cello, guitar and viola, guitar and voice. In terms of piano duos, I have heard and played piano and flute, piano and clarinet, piano and violin, piano and viola, piano and oboe, piano and bassoon, piano and voice, piano and cello, piano and trumpet, and, and of course, piano and piano. Who has heard of piano and guitar? or rather, guitar and piano? That was my question when I met the Dutch guitarist Robert Bekkers in 2001. The first piece I found for guitar and piano was a transcription of Vivaldi's Concerto in D major. We played unison in many passages, and it wasn't a lot of fun. I figured that the piano and the guitar did not make a couple. The piano is simply too loud and the guitar too soft. The pianist would feel straight-jacketed to play softly and the guitarist overwhelmed. Still, I was curious if any sheet music existed for piano and guitar. The lack of sheet music did not discourage us from wanting to play music together. Wherever I traveled in my full-time job as a magazine editor, I looked for piano and guitar compositions: London, New York, Houston, Amsterdam, Brussels, Milan, Paris. Most of the time there was a tiny guitar section, and a few duo and trio compositions, but not for piano and guitar. We searched the Internet. We asked friends. We told people about our tenacious hunt for that elusive combination. We found many transcriptions of guitar concertos where the piano served as the orchestra. We found a few genuine pieces written for the two. It's been a difficult search, and we're still looking. When he heard about our quest, the Dutch guitarist and composer Erik Otte decided to write and dedicate an original piece for us. Inspired by the Spanish poet Federico Garcia Lorca, Haarlem-based Erik Otte titled the piece "Suite Rio de la Plata" after a silver river in South America. Its four movements span the four stages of love: break-up, playing the field, falling in love, living happily ever after. He made extensive use of the percussive effects and the melodic and harmonic capabilities of both instruments. Although initially it was hard to get the rhythm right, especially the synchronisation with the guitar and the unusual beat, I must say it was a very enjoyable piece when we finally got it together. It starts with a crushingly loud double octave on the piano, symbolising a big slam of the door. That's how couples part, I guess, after a big fight. When the decay of the piano sound is near an end, the guitar enters ---- a sad passage wreaking of regret and dread of the future. At our premiere of Erik Otte's piece in Santpoort, a town near Haarlem, last autumn, the American composer Allan Segall was so excited that he announced to the audience that his next piece was for piano and guitar. Amsterdam-based Segall, who specialises in composing for "neglected ensembles" or rather, unique combinations, had come to the concert as he had never heard the piano and guitar together before. This March in the Dutch village of Bennekom, near Ede, east of Utrecht, we premiered Allan Segall's monumental piece, "When JS Bach, Stravinsky, and The Who Met." Bach's counterpoint met the harmonic ingenuity of Stravinsky and echoes of Tommy. It makes use of the kind of terraced dynamics used in the Baroque era (not gradual increase or decrease in loudness but a kind of stepped plateaus of loudness or softness). The challenge for the pianist is the cross-handed octaval jumps. The guitarist has the virtuostic challenge of playing a lot of notes very fast all the time. 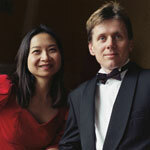 Since 2001, Robert Bekkers and I have performed in the Netherlands, North Cyprus, and London. We have collected and studied enough duo repertoire to play two different concerts of guitar and piano music. If we were to include our solo performances, then we could have three or four unique concerts. Why piano and guitar? They are two of the most popular instruments. Regularly heard in the pop music and jazz scene, they are absent from the classical music world. Why? We think that the modern grand piano is too intimidating for a mellow instrument like the classical guitar. So what can you do about it? We approached the Amsterdam-based Dutch luthier (guitar maker) Jeroen Hilhorst who has been researching into the so-called "concert guitar" to compete with the concert grand (piano). Since 2001, we have been experimenting with acoustics and positioning of the instruments on stage. We're in regular dialog with Allan Segall and Erik Otte about how to write for the combination. Segall believes that both instruments can be heard if they play different registers. Otte chose to alternate the role of each instrument, such as percussion for the piano while melody line for the guitar. What to call our piano guitar duo? Why not guitar piano duo? Ku duo? Bekkers duo? Ku-Bekkers duo? Bekkers-Ku duo? For now, the more important thing is to introduce this unique combination to wider audiences. This will then inspire more composers to write for us. Just think of all those children that are learning to play the piano, not to mention those that play the guitar. The good news is ---- they can now play together! Visit the new site of Piano Guitar Duo and listen for yourself!